If you take deposits at your workspace, read on for the best way to process them in Habu. Do you take refundable deposits when a member joins your space, whether that's $10 for a key or $1000 for an office or when a non-member makes an event booking that requires a refundable deposit? If so, there is a best use case to do this within Habu if you've integrated your account with one of our payment gateways. 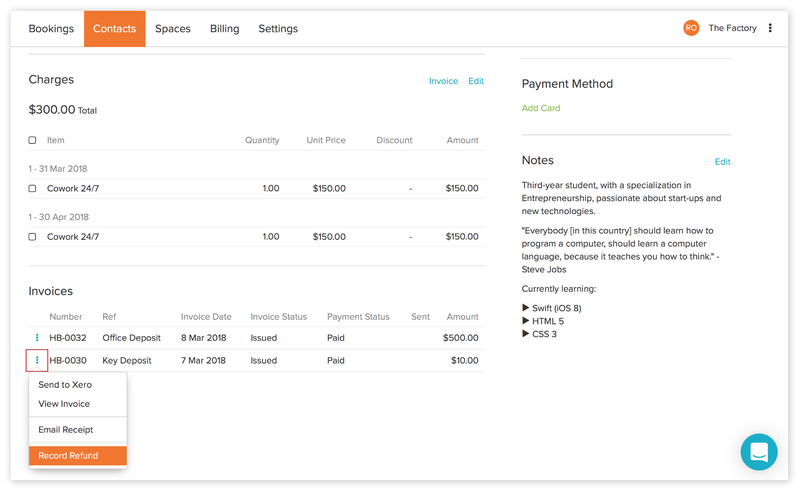 If you need to refund an invoice, whether deposit related or not, you should always do that directly through Habu. You should never refund through the payment gateway you're using for a Habu related invoice. 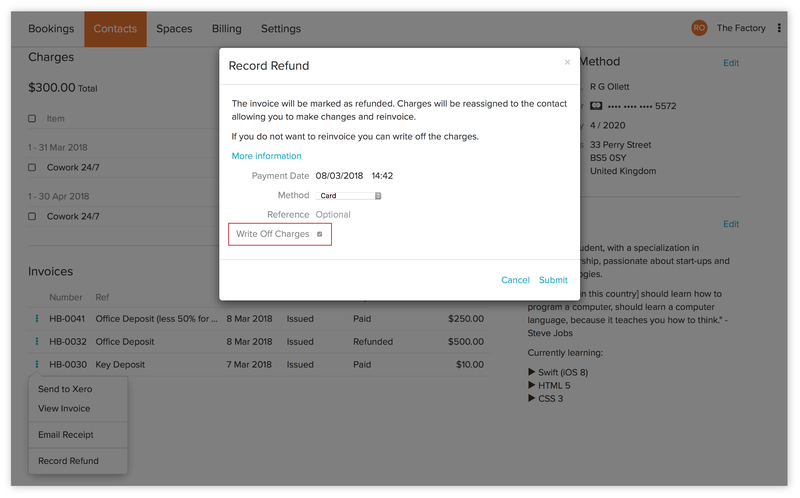 You can also only refund full invoice amounts too. Partial refunds are not currently possible in Habu. There are a couple of ways that you might want to create a deposit. The first is to create a deposit as a product. One of the benefits of doing it this way is that it means you have a standardized price for you and your team to use. This works particularly well for deposits that you use regularly. Once saved, you can then add this to a contact profile page by clicking on Edit and going to Orders. Select '+ Order' and choose the relevant product. After this you should select the deposit related charge and invoice for it individually. This means you'll be able to refund it independent from any other charges or invoices. The second way you can create a deposit is by using the one-off charge function. The principal advantage of using this option is that you can be completely flexible with labelling and pricing the deposit. This is useful if you don't have standardized deposits. As with the previous way to create a deposit, you should select the deposit related charge and invoice for it individually so that you can refund it independent from any other charges or invoices. This will ensure the charge doesn't reappear in the list of charges. 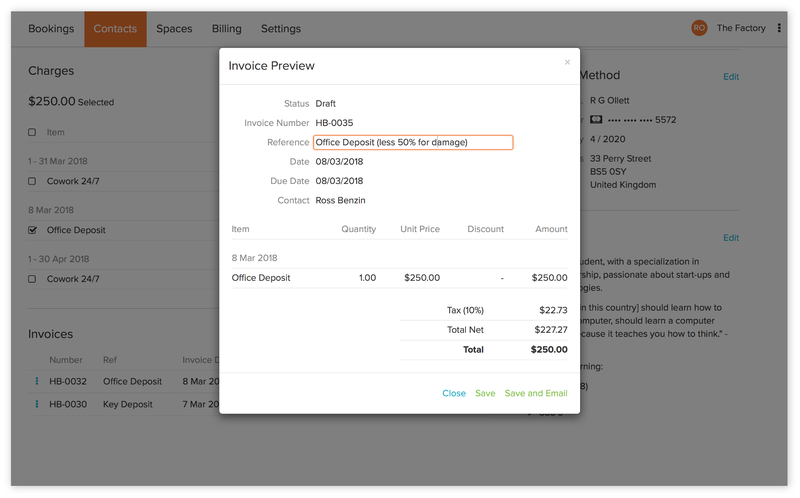 If it remains in the list of charges and you have auto-invoicing enabled, an invoice will be generated for this charge on the 1st of the month and potentially emailed out and auto-charged. There are certainly some use cases where you might want to only partially refund the deposit as, say they damaged your lovely wooden floorboard, or broke something. Unfortunately partial refunds aren't currently possible in Habu, and you should never refund or partial refund through Stripe or Adyen as the refund will not be paid in to your contact's account. If their card is held on record you can take payment for that amount and send the receipt to the contact. The second workaround to achieve this would be to refund the invoice in full and then to generate a one-off charge for the amount that you want to take off the deposit. You'd then follow the same steps as above.